The restaurant is called The Grill Hut-Fresh Kabobs on Mesquite Fire. One is located in Laguna Niguel, but it’s their newest location I went to on Los Alisos in Mission Viejo (north of Marguerite Pkwy). Frankly, I don’t eat kabobs because I’ve found in the past they’re too highly seasoned for my stomach, and cause indigestion for hours. Don’t ask me why I chose to eat here. 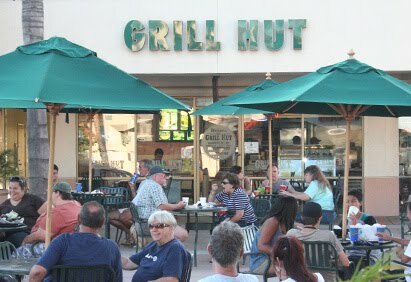 I was very hungry, at the shopping center, and there was the Grill Hut. Happy to report I had no problem with their seasoning, yet the food I ordered was flavorful. Another thing – I don’t like eating breast of chicken, tastes like a shoe. But the young woman who worked there convinced me to try it. Woohoo! It’s the juiciest, most tender I have ever eaten. I’ll be ordering it again. In case you’re wondering, they marinate the chicken in yogurt, lemon juice, olive oil, salt and pepper. You can order the chicken in a salad, a wrap, main dish, ala carte, as a low carb meal, or a chicken kabob a la carte with hummus (only $5.99!). Starting April 5th, 2010, they’ll be offering the chicken in a pita sandwich. If you order the kabob main dish, it includes choice of two items: Garden green salad, grilled tomatoes, basmati rice and bread. The kabobs are available in the ground beef ($7.99), chicken ($8.99), steak ($9.99), veggie ($6.99), and fish ($9.99). Their food is fresh, meats have not been frozen nor is any preparation done in a microwave. Here’s a link to their website where you can view the menu and learn a little bit more about them. Honestly, there’s just no reason to eat at McDonald’s, Wendy’s, Quizno’s and the like when for similar cost, your food can be fresh, healthy and delightful. MISSION VIEJO: 28815 Los Alisos Blvd, Mission Viejo, north of Marguerite Pkwy in the Von’s Shopping Center. As soon as you drive into the shopping center, turn right, you’ll see it on the right. Do you have a big event coming up, like a wedding, job interview, a reunion? Stress is a common trigger for a cold sore. You’ll kick yourself if you get one knowing that a dab of Cold Sores Begone™ could have prevented the whole thing at the tingle. Get it now. Want to Communicate With Your Pet (Here or Passed Over) or Ask a Question About Yourself? A friend of mine, Frances Greenspan, is an animal communicator, among other things, including artist, and teaching maven how to sell on ebay. Sessions start at $20 for 20 minutes.